Keeping clean may not be your top priority when camping, especially if your camping trip is only a weekend away. But if you are travelling for longer, or at a location where there are no facilities such as shower blocks, your thoughts might turn to smelling better. Or you just might be a camper that loves showers. Previously we have covered 6 tips to being clean when camping, and one of the points we mentioned was the use of a shower. As mentioned in that story, a camping shower can be perceived as a bit of a luxury, and not always practical. A shower would not be on any “essential gear” list, and if you are new to camping, it’s definitely not something that would be on my list until you know you are a keen camper. So don’t rush out and buy one straight away. But maybe down the track or even now, your thoughts have turned to getting clean after a busy day outdoors. What’s available and is it right for you? 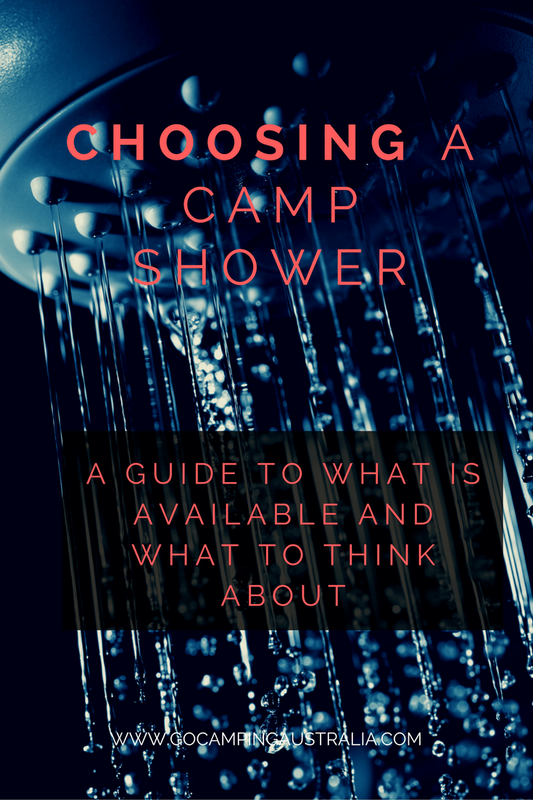 This is where this guide to camping showers and how to get the right one for you is important reading. So what are the good things about camping showers? camp showers can have many other purposes such as cleaning dishes/animals/cars/spot cleaning/other outdoor activities like fishing/marine and are not limited to just personal cleanliness. Your choice on your camping shower is going to be dependent on some personal key factors, that only you know. Like any camping gear purchase, you need to do some thinking about your own personal camping needs and style. Your budget – how much do you want to spend on a shower? Style of camping you do – eg tents, caravans or backpacking? Space requirements - how much room in your vehicle do you want to utilize for camping showers? Will you be bringing extra water on the trip for the shower and if so, where will you store it? Weight – lightweight or heavy? Frequency of needing a shower – are showers going to be a part of every camping trip, or just now and again? Does the campground you camp in, allow bush showering? You might want to think about the above just so you have a clearer idea on what you want and what you need; it may not always be the same thing. If you are frequently camping in a caravan park, then your need for a big water heating shower might be less important as you have ready access to amenities blocks. Remote campers in the Outback, might need a shower that doesn’t use a lot of water and is good for a quick, minimal wash up. Only camp once or twice a year? Then spending a lot of money on a shower should be a lower priority, so you need a cheaper option. Frequent campers who set up a site for a longer period or are on very regular camping trips/long term camping, might want a water heating shower to increase your frequency of showering, plus use it for hot water in general. Lightweight campers need to think of how they are going to carry something in their pack. Everyone camps differently, so make sure you know how you like to camp and where you camp, to help narrow down the options. What sort of showers are available? The types of showers in the market place seem to fall into distinct groups which we will briefly touch on here. These solar showers rely on the heat of the sun to warm the water, and come in a variety of styles. No sun means no warm water. If you plan on being out for the day, you will want to make sure the bag doesn’t fall into shade otherwise the water will cool down quite rapidly. So be organized with filling your bag and making sure that when the sun comes out, your bag is going to be able to absorb maximum rays. The manufacturers issue a warning that the water within the bag can become dangerously hot, and I suppose depending on where and when you use it, this may be an issue, so always exercise caution. The basic versions are the black PVC bags that are designed to hang from a tree (after being in the sun all day), and have a small hose as the showerhead (it’s generally detachable, and the bags can be prone to leaking when full). If looking at a solar shower you will notice that this is a very common product produced by many manufacturers, with varying features, but all basically doing the same thing. The more pricey solar showers may have a few more features but work out if they are features you actually need. Some solar systems will just have the bag, and you can purchase additional hoses, showerheads and 12v pumps to work in conjunction with the solar shower. Negatives: Can be very heavy to lift when full of water. Requires a sunny, warm day and a number of hours to get the hot water. Can puncture. Will need to move the bag to maximize time in sun. Limited water capacity for a family. Some handles are flimsy. Work on gravity to deliver the water when used as a shower. 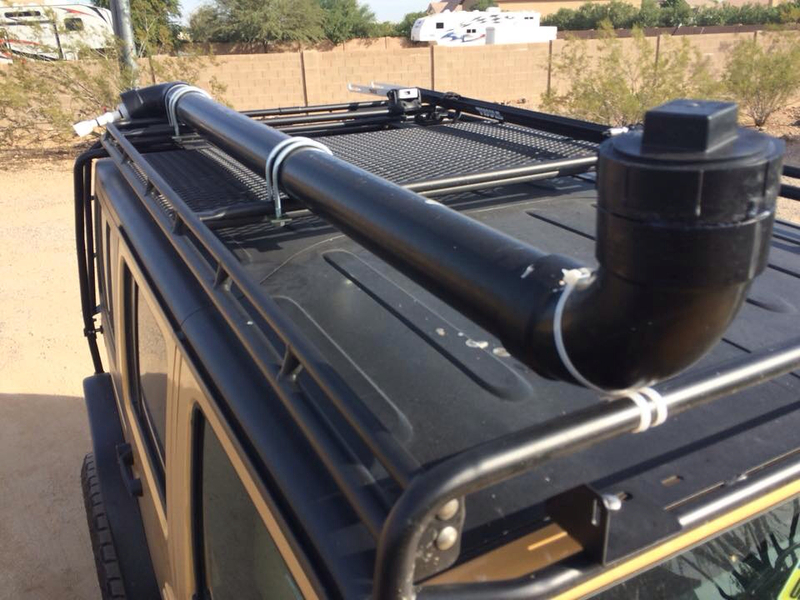 You can also have the option to have a tank attached to the top of your vehicle (like a roof rack), and allow the sun to heat the water contained within this tank throughout the day. The RoadShower is the leader in this area and would be the most common variation seen around on the internet. It holds 19L of water, and it takes about 2 hours of temps above 30 degrees Celsius to heat. Pressure comes from adding air to the tank (via a bicyle pump). Positives: Always attached to your car so no extra space taken in the car. Good height for a shower. Unobtrusive. Negatives: Requires full sun for at least 2 hours. Available from USA only (though they ship to Australia). No Australian store to see it. Expensive. Further information via Roadshower website. These showers require Lithium/12V batteries or gas to heat the water. 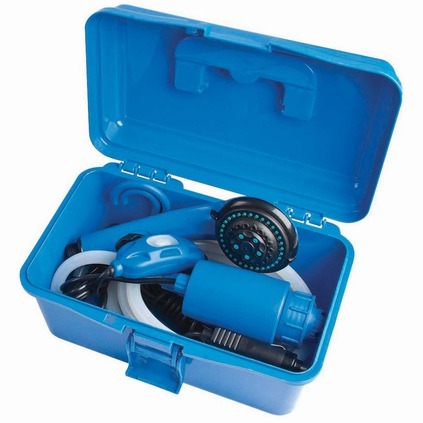 They come with the necessary hoses and showerheads, and deliver pressurized, heated water on demand. With the ability to control the temperature, this is camping in comfort. Some components to operate may be sold separately eg. 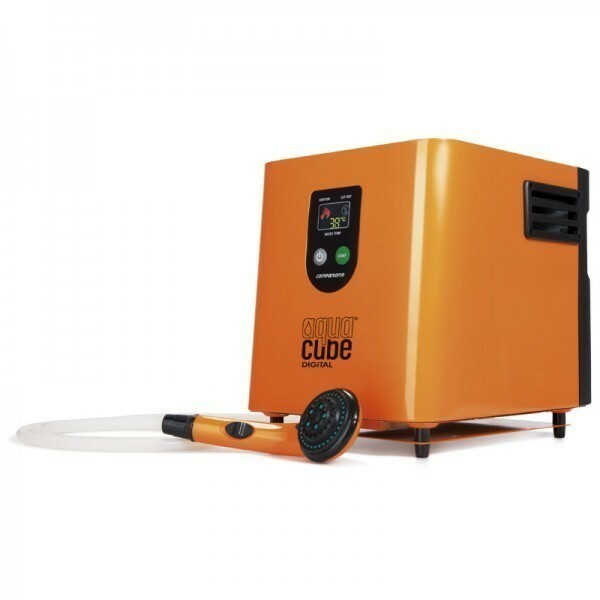 the Aquacube Digital needs a gas cartridge to operate (or a specific hose to attach to your gas bottle) so that's another cost you must factor in. Do your homework when you narrow down a model that appeals. Shop around. After sales service is very important and ability to get parts/extras needed to operate should be easy too. Make sure you buy everything you need to operate successfully and safely. Positives: Hot water quickly. Temperature controls. A variety on the market to look at. Negatives: Weight and Size. Need to use a power source (if using gas you will need to have ample). Expensive: some can be cost around $500. A shower that gets heated not from a battery/power source, but from a campfire or stove top to heat the water (solar can remain an option for this if needed). This shower also fits into our section on Pressure Showers (See below) but we have kept this shower in its own category due to the unique ability to heat the water. Positives: Variety of heat sources to choose from. No power required. Simplicity in using. Negatives: As the hot water stored within, need to be careful if moving. Depending on model, can be bulky. Not cheap. 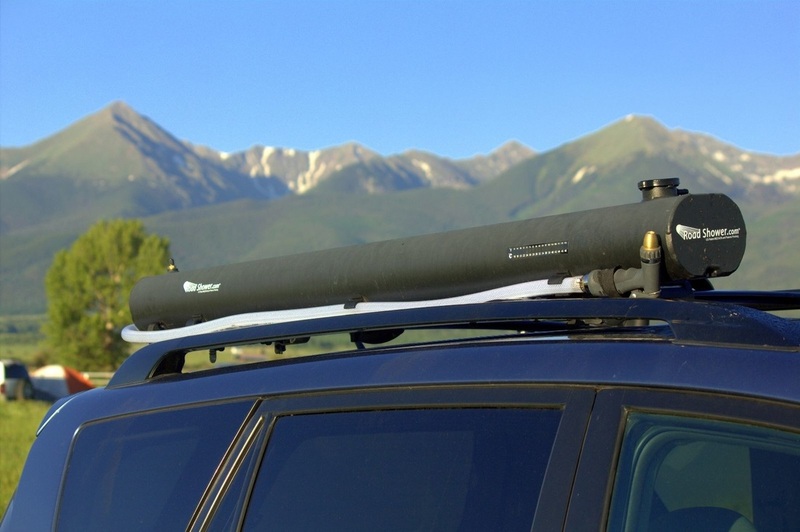 These are showers that utilize your vehicle to heat the water (which you still need to be able to access from a water source as opposed to storing it as part of your vehicle). 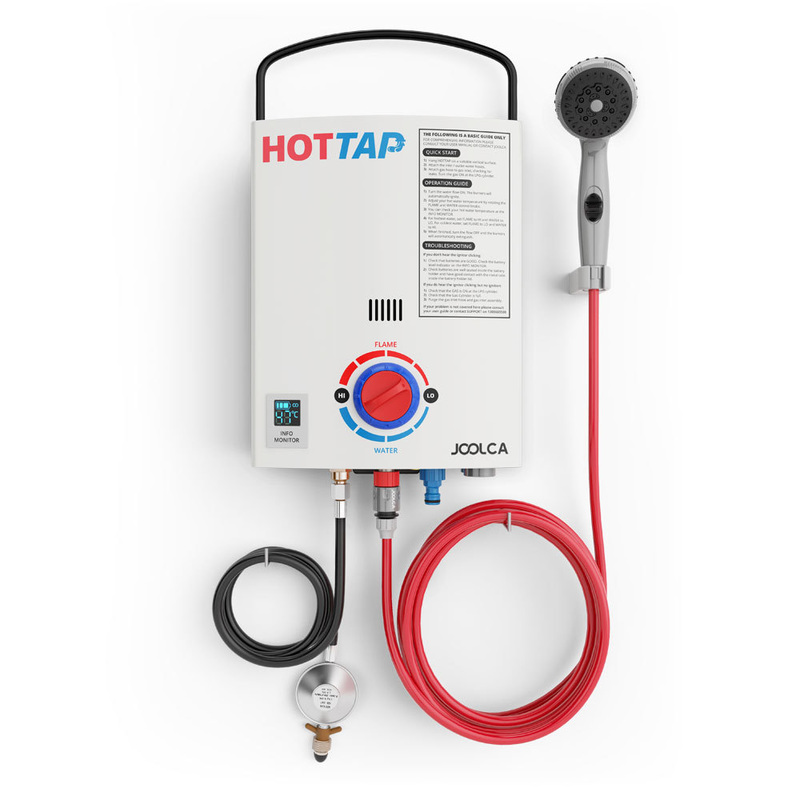 By attaching a heat exchanger to your vehicle (under the bonnet) and the use of a pump (all supplied in the kit), attaching hoses to the vehicle will allow you to get pressurized heated water – which can be recycled again. The most popular around seems to be the Glind Hot Water System. The following is an extract from their website, which really explains it a whole lot better than I ever could!! The Glind Heat Exchanger is inserted into the vehicle's heater line. A robust 12 volt marine pressure pump draws water from any source, through a seperate line in the Heat Exchanger. The shower water does not mix with radiator water or coolant. Positives: Attaches to any vehicle not just a 4WD. No need for extra power sources as the power comes from the engine. Not bulky. Always accessible. Can use water from a source, or just a bucket. There are other manufacturers apart from Glind, making similar shower systems fitted to your car, such as Helton Heat Exchangers and Bushranger. As always, look around and find out which one is best for you if this is the shower system that is your choice. No batteries or power are required – but by using pressure (via a pressure chamber or manually) water is delivered via a hose. 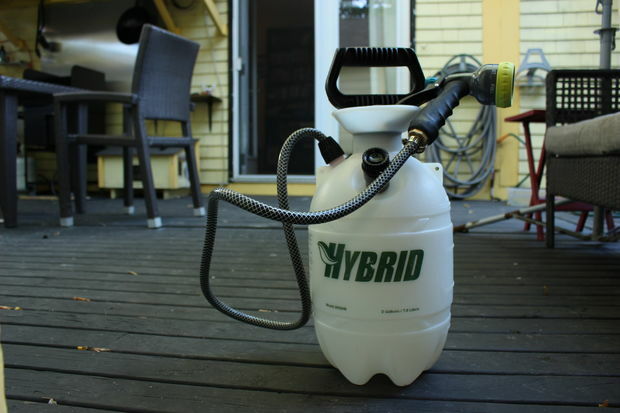 There are a few varieties on the market – and for some people they even use a weed killer pump bottle (without the weed killer) for their shower. The cold/hot water needs to be added to the containers before delivering the pressurized water. 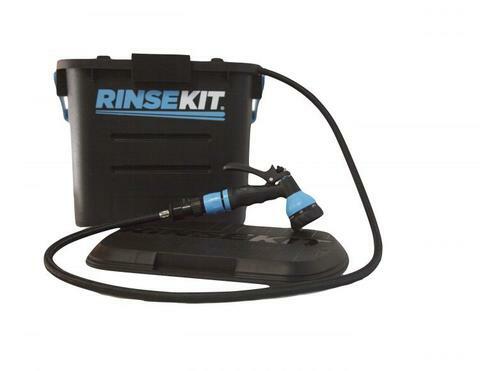 The Rinsekit – a bucket that needs no pumps or batteries. It's a simple concept that delivers you water when needed. You could fill it with water before you leave home (it will be cold, as it won't maintain heat) but it's a quick way to get a cold shower without having to find water once at the campsite. 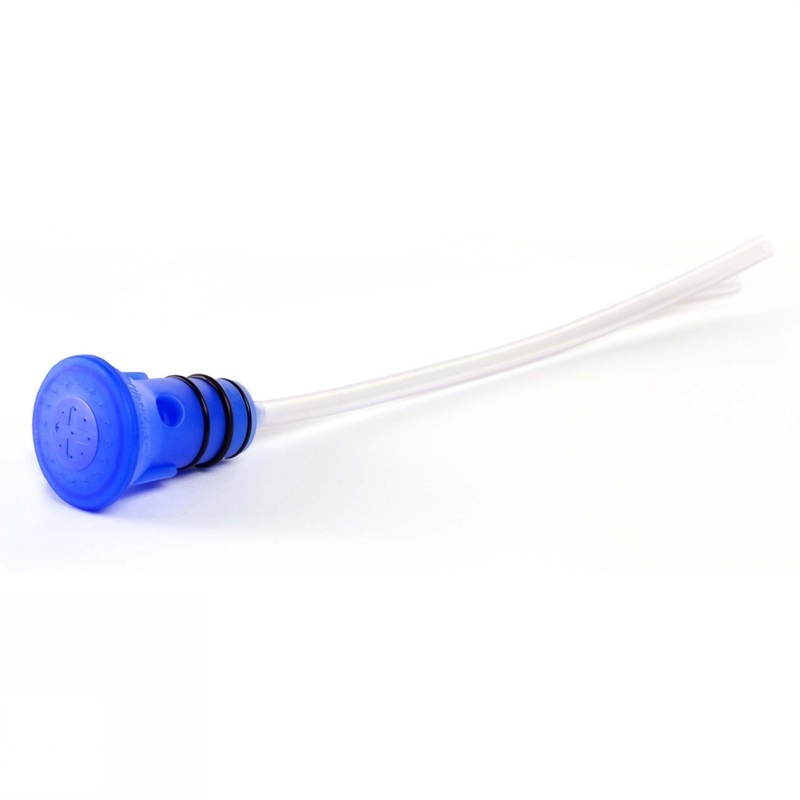 The RinseKit hose quickly attaches to your water spigot with a quick connect coupler and fills the two gallon eon™ pressure chamber with approximately 65 psi of water pressure (standard home pressure) in 20 seconds time -- and can hold pressure for up to one month. Simply attach the spray nozzle to the RinseKit hose with the quick coupler, select one of the 7 spray settings and fire away! This patented design has no moving parts and can be filled with hot or cold water an infinite number of times. You will need to fill the Rinsekit via hose, so you will need to provide that, plus there is no way to heat the water once the water is in the Rinsekit. Helio - This would fit into the solar shower section, but it varies a little, hence why it falls into the pressurized showers. Unlike the normal solar showers, which are generally hung up high, so gravity can do its work, the Nemo Helio Pressure shower works on the basis that you fill it with warm water (or leave in the sun), the Helio water delivery comes via foot pump. It’s lightweight when empty, and squashes down easily, so this is one for campers who hike. As one of the originals and most likely still the best, the price is around USD100, and its availability in Australia is slightly more limited. See the international distributor information at Nemo. We wrote about the Helio Pressure Shower a loooong time ago, and you can read more about it, as it is still a camping shower that is going strong. There are now copies of the Helio Pressure shower available such as the Spinifex Compact Pressure Shower, available in some camping stories for around $34. Positives: No batteries/additional power sources. Depending on brand, could be suitable for backpacking as compresses. No need to lift above your head for the water to reach you, as gravity is not required. Negatives: Harder to clean. To get hot water, you have to add it hot to the shower. Size and weight may make it not suitable for some campers. If you are looking for simplicity, with no hot water, there are showers available for you. These showers are for people who just want to get clean with minimal fuss and financial outlay. They are basic in design and all about getting wet. Sea to Summit Pocket Shower – this is what it sounds like: a shower that folds down to fit into your pocket! 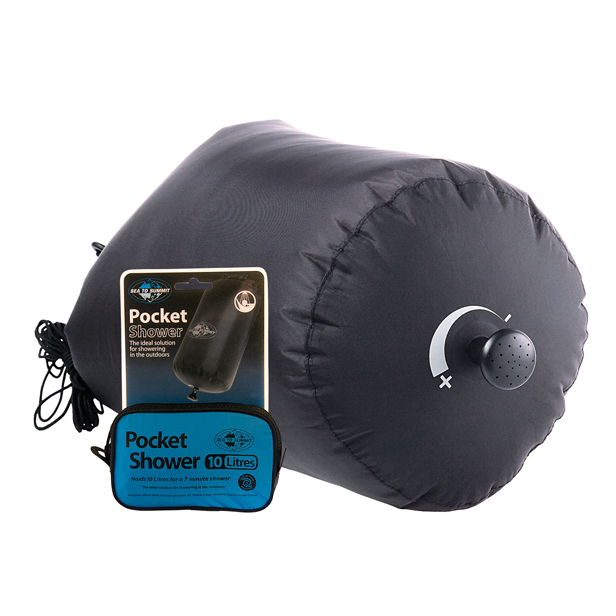 Like a stuff bag, this is shower with the similar features that Sea to Summit stuff bags have – heat resistant fabric, and a closure just like you do with a stuff sack. Fill the bag with water (if you have hot water available then that's OK to use) and close. At the base there is a small shower rose that can be turned on/off. Holding 10 litres of water, it can be suspended by the provided D Rings from a tree etc thanks to a long cord to thrown over a branch. It has a dual purpose too. When not using as a shower, turn it inside out (great to dry it), and you can use as a stuff sack!! Great for those who like to keep it light and simple. The SpaTap - is a silicone device that attaches to a plastic bottle (chances are you have a plastic bottle lying around like a water bottle or soft drink container). You tip up the full bottle of water (or hang it from a cord) and remove the plug. The plastic device is now a perforated shower head, allowing water to flow through. The makers of this device, have great suggestions on how to use this device around camp - for washing hands or water when cleaning your teeth or washing up dishes. To find out more and how you can buy your own, see the website SpaTap. The more you buy the cheaper they become, with a starting price of $24. Video below for further information. The Canvas Bucket Shower - a simple shower. Canvas bag with a shower rose. 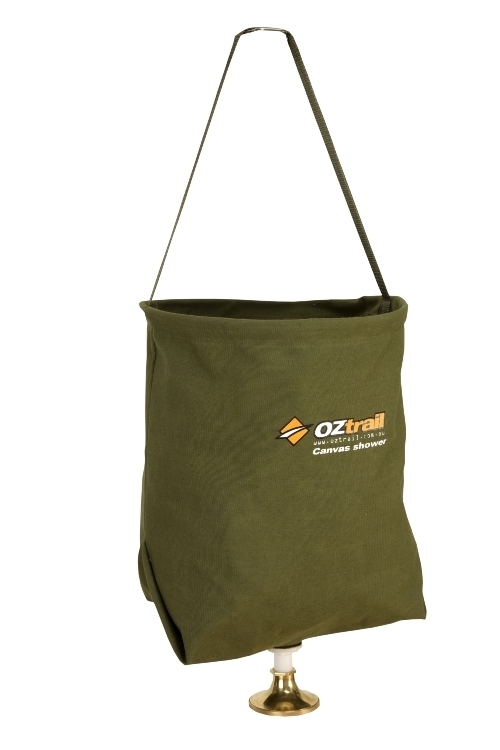 Like the solar shower concept where gravity does the work, the Oztrail Canvas Shower Bucket works on the same principle. Just fill it up, hang high and turn on the brass shower rose. No solar heating, but a simple concept. The BottleShower - very similar to the Spa Tap, this also works on the premise that you have a narrow neck plastic bottle you can utilize, and the water comes out via a shower rose attached to a bottle. The Lifeventure Travel Bottle Shower - is also another similar concept as the two above, once again, utilising a bottle to turn it into a shower (or tap). Fitting most water bottles, a 2L water bottle will give you 2min 24 second shower - which may be enough to get the grime off if used wisely. For the innovative camper, there are camping showers that are made at home. By using products around the house or available locally, there are showers that don’t come from any store but from the homes and sheds of world. Thanks to the internet, we show you a few of the homemade camp shower options. If the store bought items don’t thrill you, then maybe these will. This is just a few that we found. There are endless versions if you are feeling inspired. Of course, you can get basic with just a watering can or with the bucket (as pictured). 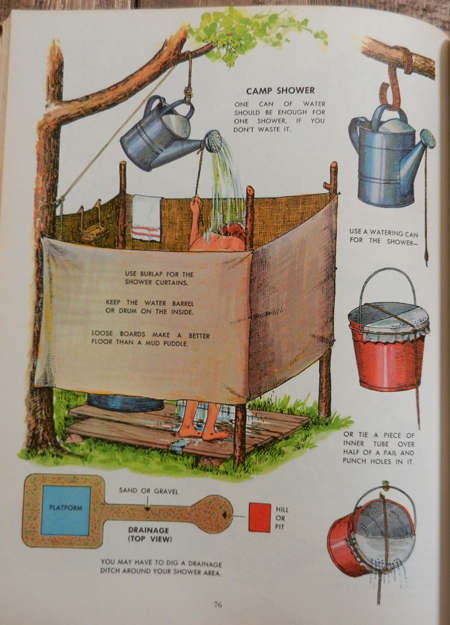 This is vintage camping, from the Golden Book Series, but the principle is the same as all the other showers - getting wet! This might win for the most simple shower EVER. Its about putting holes in an umbrella, and then hanging the umbrella (open) from a tree. By adding water to the open umbrella, the water comes through the holes, and voila! You have a shower. You can hang curtains from the umbrella spokes to create your own private oasis. If you do commit to a shower, then you might want to think about what accessories you need. Some showers might need separate purchases to complete them, which can add to the cost. Check before you commit to purchasing, what the shower comes with and what you will need to buy separately. Are adaptors needed to use with different hoses? A few accessories that you might see when looking around are as follows. 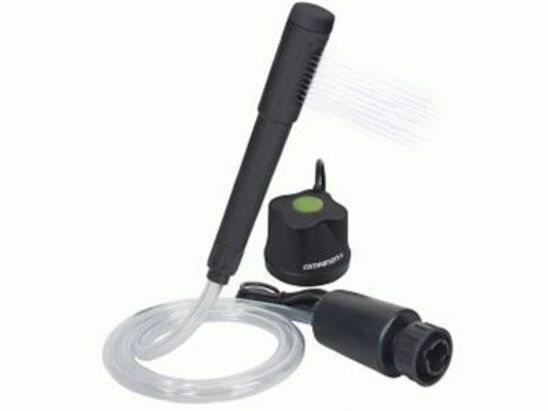 A popular way to shower is to buy a 12v shower head and hose that has a pump. Place the pump in a bucket of water, and turn it on, and you have water pumped through the hose. If you have used some of the previous water heating showers, you may even end up purchasing one of these hoses. It's a quick and cheap way of getting water from a water source/bucket and pumped through to you. These 12V shower heads might come with suction cups so you can attach up high, or different length hoses or storage bags, so they will vary a little in cost. Some will come with the ability to use batteries instead of a 12V. Look online for a good price - but it's unusual to see a basic model that's more than $40. The more features, the higher the price. Shower tents never seem too sturdy, and you can spend a bit of time when showering, praying that it won’t collapse or a big gust of wind sweep it away. Be wary of hanging any solar bags on these frames, as they won’t support the bag (successfully). The above 12V pump is handy to use in conjunction with a solar bag (not hanging) in a shower tent. Shower tents that come with some mesh pockets (to put shampoos etc) in are handy, and saves them sitting on the ground, A heavy plastic sheet that hangs inside the tent, and allows you to put a towel underneath it, and therefore remain dry, is a good option too! Many campers use a shower tent as a toilet tent as well - so dual purpose. Just remember to peg out your shower tent, use guy ropes and watch out in high wind! Alternatively you can purchase a toilet and shower combo tent, so you don't have to take out the toilet every time you wish to shower. These dual tents can come as a pop up version or a sturdier one with poles. Consider standing on a floor foam mat so your feet don’t get grotty during the shower, but make sure any run off from the shower does not enter any water source. Some tents come with built in floors which are not ideal as the water builds up on the floor of the tent - a big bucket to stand in will be required. Alternatively, some tents have removable floors for showering options. Make sure before you buy, you check the flooring for your shower tent. If you forget the floor mat on a trip, just grab a floor mat from the car as a temporary way to keep your feet clean. Standing in a big bucket can also help, and allows the water to be captured, and recycled if needed. Remember – not all campgrounds want soapy water flowing at the campsites, so heed any rules in regards to this. The above tent is the Outdoor Connection Outhouse Toilet/Shower tent. We actually own one of these, and it takes a bit more time than a pop up tent to set up (it's like setting up a mini tent), but it's also a lot more sturdy in bad weather. The standard pop up toilet/shower tent. Prices vary depending on brand and quality of materials used but the concept remains the same regardless. All seem to be tricky to fold up and put away. Prices can range from $20 up to over $100. It really is great to wash off the grime of the day, and to climb into your bed at night, clean (or cleaner than you were) but before committing to a camping shower, think about your camping needs and where you camp, and the practicalities of having a shower when camping. 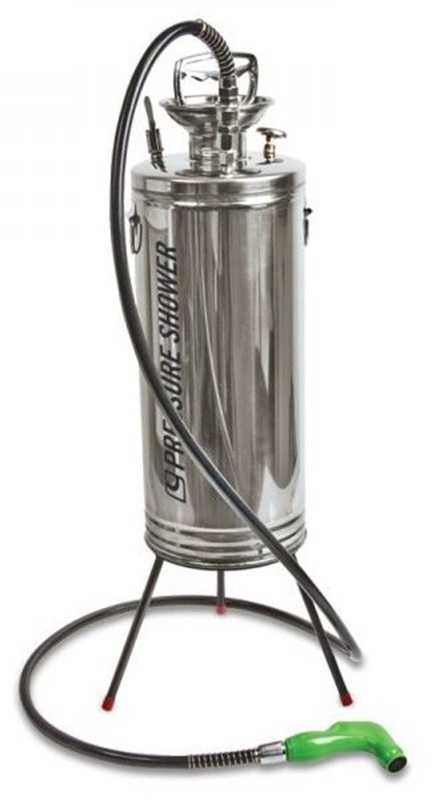 Find a shower that fits in with your camping set up and of course your budget. Like always, do your homework to get the shower that's right for you! All prices were correct at time of writing. Some of the above products are from companies we are affiliated with. To find out more about our affiliates, please read our Disclosure Policy.